So, this is my learn boxing at home workout area. 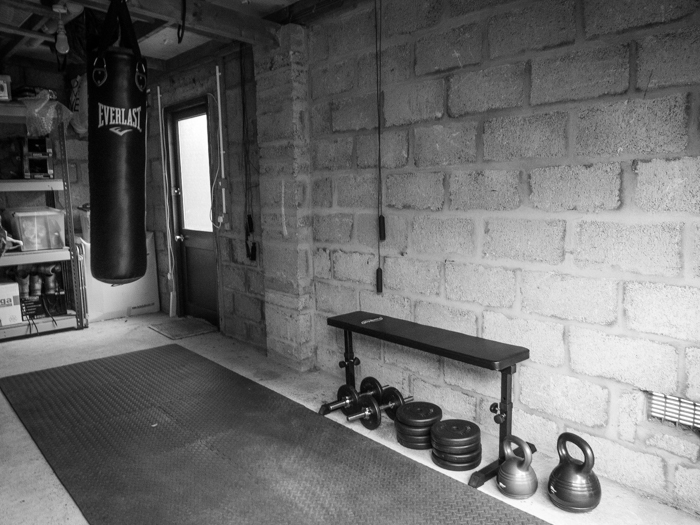 John’s gym, well it’s my gym/garage. I don’t mind admitting to feeling relieved that spring is on the way. It’s been chilly out there. Please ignore the kettlebells (bottom right), they could be classed as ‘decoration’, I’ll get around to them soon enough! I got thinking today about the alternatives to my ‘home gym’. It turns out I don’t live anywhere near a boxing gym. I googled it. The nearest is 28-miles away. But even if there was a boxing class much closer – I very much doubt I’d go. Good on anyone who goes to a class, or help people by coaching one – I’m sure it’s of great value and they enjoy it. But that’s just not me. So, today I was feeling pretty lucky. It’s exactly 11 steps from my house to my garage door. It takes less than 1 minute to put on my gel wraps, start the video and begin the warm up (yes, timed it). And then I’ve got access to a boxing coach – all from my garage! – it really is easy to learn boxing at home! Convenience is one thing but beyond that ‘privacy’ is another major factor for me. I’m a beginner, and it can be tough starting out – let alone having to worry about who or what’s going on around you. There’s nobody to see me gasping for breath or bent over in sheer exhaustion. I’m sure it’s not attractive to watch. There’s also no-one to hear my colourful language at the end of each 2-minute round (and there’s plenty). Most of all, I’m the only witness to my mistakes, like in the first week, when I almost hit myself in the chin with a right uppercut. Yes, really. Today felt like a big breakthrough. I was really up for it! Power & Speed 2 is a great workout for slogging it out, giving all you’ve got. It’s varied and it’s relentless. On the bag, then squat/pulses. On the bag, then crunches. But I was keeping up, and felt I could cope a lot better. I defy anyone who says 6 hooks to the body, then 6 hooks to the body for 30 seconds is easy. If it’s easy – you’re not putting the effort in – hit harder and faster! I’m still struggling big time with press ups but the crunches are getting easier. And I’ve added in extra skipping. I need to practice. Can I skip whilst running on the spot, knees high? Not yet. Do I look like a jumping potato? Yes. But it’s thoroughly exhausting – and that’s a good sign for me.